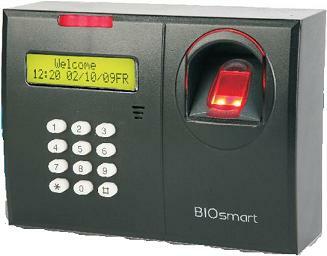 BIOsmart is an elegant and compact Access and Time Attendance system. It can run on standalone as well as network mode. This User-Friendly system provides seamless integration with HID, conventional proximity and latest smart card Technology. It can operate in either standalone or network mode. All products have built in relay to lock / unlock the door. Advanced Shift Management and Attendance Features. Access Control Configuration (Doors, Time Zones, Door Open Time, DOTL etc.). Cater to the needs from Small offices & Single location to Multi-Company, Multi-location & Multi-Divisions. Payroll Interface for any payroll package. Real time auto update of Finger Templates to monitor changes in the fingerprint. Configurable Operating Modes - Only Card; Only Finger; Card + Pin + Finger etc. Configurable modes of sensor: 1:1; 1:N & auto-identification. Can be connected to third party controller with Standard Wiegand inputs. Advance features like Anti-pass back, Time Zone.